This is the source for the DigitalOcean guide How To Migrate a Parse App to Parse Server on Ubuntu 14.04, by Brennen Bearnes. It’s best read there, with comments. Copyright © 2016 DigitalOcean™ Inc. This work is licensed under a Creative Commons Attribution-NonCommercial-ShareAlike 4.0 International License. Parse is a Mobile Backend as a Service platform, owned by Facebook since 2013. In January of 2016, Parse announced that its hosted services would shut down completely on January 28, 2017. Fortunately, Parse has also released an open source API server, compatible with the hosted service’s API, called Parse Server. Parse Server is under active development, and seems likely to attract a large developer community. It can be be deployed to a range of environments running Node.js and MongoDB. This guide focuses on migrating a pre-existing Parse application to a standalone instance of Parse Server running on Ubuntu 14.04. It uses TLS/SSL encryption for all connections, using a certificate provided by Let’s Encrypt, a new Certificate Authority which offers free certificates. It includes a few details specific to DigitalOcean and Ubuntu 14.04, but should be broadly applicable to systems running recent Debian-derived GNU/Linux distributions. The target server should have enough storage to handle all of your app’s data. Since Parse compresses data on their end, they officially recommend that you provision at least 10 times as much storage space as used by your hosted app. Let’s Encrypt is a new Certificate Authority that provides an easy way to obtain free TLS/SSL certificates. Because a certificate is necessary to secure both the migration of data to MongoDB and your Parse Server API endpoint, we’ll begin by retrieving one with the letsencrypt client. You must own or control the registered domain name that you wish to use the certificate with. If you do not already have a registered domain name, you may register one with one of the many domain name registrars out there (e.g. Namecheap, GoDaddy, etc.). If you haven’t already, be sure to create an A Record that points your domain to the public IP address of your server. This is required because of how Let’s Encrypt validates that you own the domain it is issuing a certificate for. For example, if you want to obtain a certificate for example.com, that domain must resolve to your server for the validation process to work. For more detail on this process, see How To Set Up a Host Name with DigitalOcean and How To Point to DigitalOcean Nameservers from Common Domain Registrars. future, simply run Let's Encrypt again. Note the path and expiration date of your certificate, highlighted in the example output. Your certificate files should now be available in /etc/letsencrypt/<^>your_domain_name<^>/. You may have noticed that your Let’s Encrypt certificate is due to expire in 90 days. This is a deliberate feature of the Let’s Encrypt approach, intended to minimize the amount of time that a compromised certificate can exist in the wild if something goes wrong. Let’s Encrypt is still in beta. Better auto-renewal features are planned, but in the meanwhile you will either have to repeat the certificate retrieval process by hand, or use a scheduled script to handle it for you. The details of automating this process are covered in How To Secure Nginx with Let’s Encrypt on Ubuntu 14.04, particularly the section on setting up auto renewal. Here, we’ll make several important changes. Exit and save the file. Create an admin user and exit. Be sure to replace <^>sammy<^> with your desired username and <^>password<^> with a strong password. 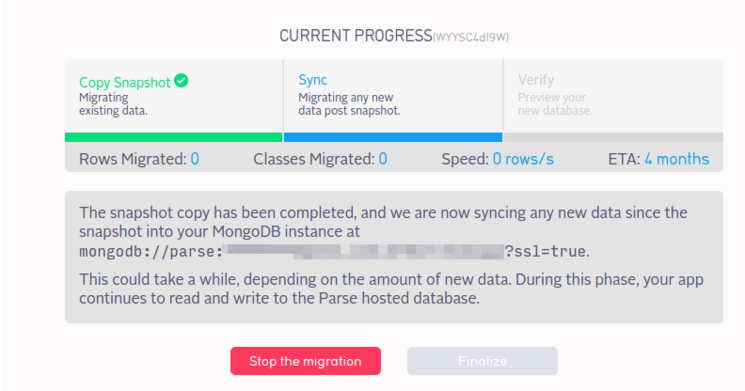 Now that you have a remotely-accessible MongoDB instance, you can use the Parse migration tool to transfer your app’s data to your server. You should be prompted to enter the password you set earlier. Once connected, choose a name for the database to store your app’s data. For example, if you’re migrating an app called Todo, you might use todo. You’ll also need to pick another strong password for a user called parse. Click Begin the migration. 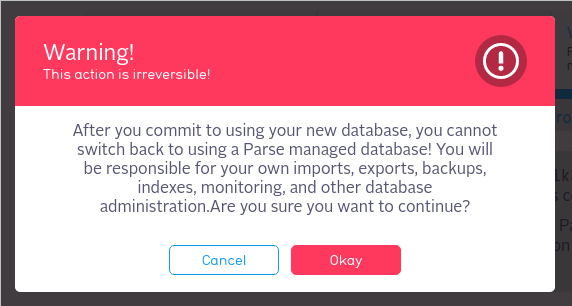 You should see progress dialogs for copying a snapshot of your Parse hosted database to your server, and then for syncing new data since the snapshot was taken. The duration of this process will depend on the amount of data to be transferred, and may be substantial. Once finished, the migration process will enter a verification step. Don’t finalize the migration yet. You’ll first want to make sure the data has actually transferred, and test a local instance of Parse Server. 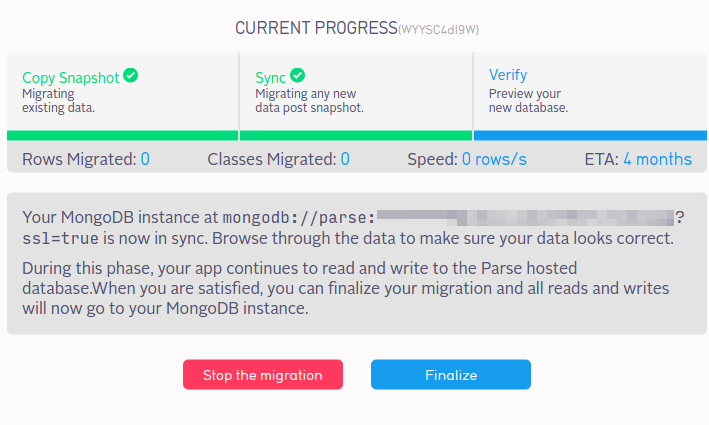 With your app data in MongoDB, we can move on to installing Parse Server itself, and integrating with the rest of the system. We’ll give Parse Server a dedicated user, and use a utility called PM2 to configure it and ensure that it’s always running. You’ll be prompted to enter a password twice. Alternatively, you can migrate any cloud code defined for your application by copying it from the Cloud Code section of your app’s settings on the Parse Dashboard. PM2 is a feature-rich process manager, popular with Node.js developers. We’ll use the pm2 utility to configure our parse-server instance and keep it running over the long term. The list of processes pm2 is running for the parse user should now be stored in /home/parse/.pm2. Now we need to make sure the parse-wrapper process we defined earlier in ecosystem.json is restored each time the server is restarted. Fortunately, pm2 can generate and install a script on its own. su -c "chmod +x /etc/init.d/pm2-init.sh && update-rc.d pm2-init.sh defaults"
System start/stop links for /etc/init.d/pm2-init.sh already exist. We’ll use the Nginx web server to provide a reverse proxy to parse-server, so that we can serve the Parse API securely over TLS/SSL. It should now be possible to test reads, writes, and cloud code execution using curl. If you have instead migrated your own custom cloud code, you can test with a known function from main.js. Your app should now be migrated. 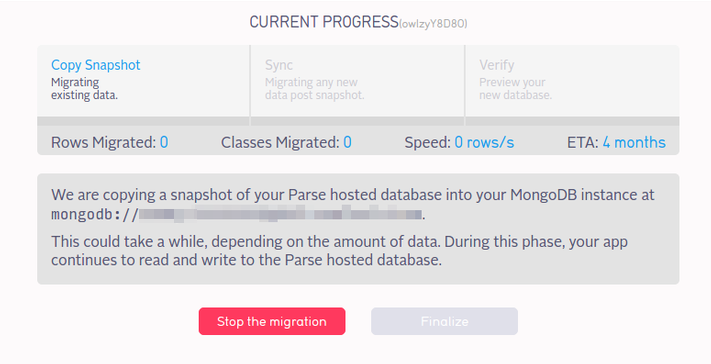 This guide offers a functional starting point for migrating a Parse-hosted app to a Parse Server install on a single Ubuntu system, such as a DigitalOcean droplet. The configuration we’ve described should be adequate for a low-traffic app with a modest userbase. Hosting for a larger app may require multiple systems to provide redundant data storage and load balancing between API endpoints. Even small projects are likely to involve infrastructure considerations that we haven’t directly addressed.